A significant number of drivers are facing extra fees or fines on Interstate 66 inside the Capital Beltway because they are using the highway without an E-ZPass during times one is required. So, what have been the traffic impacts since the tolls were implemented? WASHINGTON — A significant number of drivers are facing extra fees or fines on Interstate 66 inside the Capital Beltway because they are using the road without an E-ZPass during times one is required. 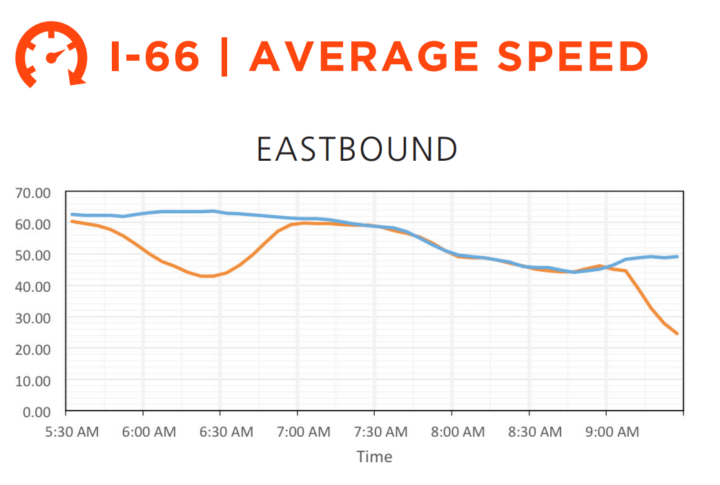 In June, more than one in eight drivers — 13.5 percent — who used all or part of I-66 inside the Beltway eastbound between 5:30 a.m. and 9:30 a.m. or westbound between 3 p.m. and 7 p.m. did not have an E-ZPass. Those drivers face penalties on top of the tolls. Overall, more vehicles paid to use the road in June with a regular E-ZPass or an E-ZPass Flex in toll paying mode (44.2 percent) than rode free with an E-ZPass Flex switched to HOV mode to indicate the driver had at least one other person with them in the car (42.3 percent). The Virginia Department of Transportation recorded an average of 15,019 daily eastbound trips on I-66 during the time period the HOV or toll requirements apply in the morning rush, and 18,086 average westbound weekday afternoon trips in June. In the morning, drivers charged a toll paid an average of $7.82. In the afternoon, the average paid was $5.21 in June. Combined, that would add up to roughly $120,000 paid per day in June based on other numbers in the report. From the time tolling began Dec. 4 through the end of June, the overall average paid by each toll payer each morning is now $8.39, with the average in the afternoon now at $5.21. Tolls are higher in the morning than the afternoon largely due to the chokepoint at the Dulles Connector Road, where traffic can frequently slow, and partially due to the more compressed time frame of the morning rush. In June, 635 of the 695,208 trips on the road during the HOV or toll hours cost $40 or more. Traffic flow changes touted by VDOT appear to have less to do with the tolls than with the expansion of HOV hours that was rolled out at the same time tolls began last fall. During the times HOV hours applied in the past, little has changed for traffic jams on I-66. In June, speeds were faster than the previous year between 6:30 a.m. and 7 a.m., when traffic used to remain slow as it recovered from slowdowns with many drivers trying to beat the start of restrictions. At other times when the HOV rules applied in the past though, speeds are largely the same. During the expanded hours though, the new HOV or toll restrictions have sped up traffic as more drivers now apparently avoid the highway and choose other roads instead, or otherwise shift their commutes. Some may also have switched to buses or other transit, but the state has not yet been able to quantify that. On parallel roads, traffic on Route 50 and Route 29 was faster in June than a year earlier at most times, although each road was slightly slower than the previous year before 6:15 a.m. On Route 7, traffic was largely slower than the previous June. On the George Washington Parkway, travel was slower around 7:30 a.m. than the same month a year earlier, faster from 8:30 a.m. to 9:30 a.m., and faster most of the afternoon.